In my experience, recipes with the fewest elements are often the most difficult to master. A variation in one ingredient can have a huge effect on the finished product. In this case, it’s the potato that tends to create problems. Potatoes vary in size, which means baking times will differ. Starch levels range, which controls how much you’ll need to “work” the dough. And moisture contents are not the same, which affects how much flour is required. Even though I’ve tried to be as specific as I can about quantities and passed along all my tips and advice on the process of making this dough, the truth is the way to get good at making gnocchi is by doing it again and again—really paying attention to what you’re seeing and feeling as you go. If the author of this recipe, Marco Canora, says the only way to become a master of this recipe is to make it over and over again, who are we to argue? And if we’re making dozens of batches of gnocchi, we’ll need at least a handful of ways to serve it, lest anyone get bored of this simple preparation (though, really, that may not be possible). There’s the rustic Gnocchi with Sausage, Tomato, Peas and Smoked Mozzarella or, if we make the gnocchi into smaller pieces, we could try Gnocchetti with Pancetta, Chanterelles, and Mint. 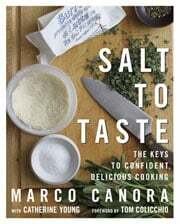 Marco suggests that a tomato sauce is a good choice, but perhaps a light coating of pesto might suffice. So many variations to try. The world is our… er… gnocchi. 1. Heat the oven to 350°F (175°C). Prick the potatoes with a fork and bake them until they are soft, about 1 1/2 hours. 3. Scoop the potatoes out of the skins and into a fine-holed ricer. Pass them through the ricer onto a large clean work surface—use your countertop or kitchen table. Using the end of a large metal kitchen spoon, spread the potatoes into an even rectangle about 24-by-12-inches. Season the potatoes generously with white pepper. When they are no longer hot to the touch, almost room temperature, beat the egg yolk. 4. Drizzle the yolk over the potatoes. Measure 1 1/4 cups flour and sprinkle this over the potatoes. 5. Using a pastry scraper, cut the flour and egg into the potatoes, chopping and then turning the mixture in on itself and folding it together, until everything is well mixed and the dough resembles coarse crumbs. Bring the mixture together into a ball. 6. Sprinkle a scant 1/4 cup flour on the work surface. Place the dough on the flour and press down, flattening it into a disk with both hands. Dust the dough with another scant 3/4 cup flour. Using your hands, fold and press the dough until the flour is incorporated. Add two dustings of flour to the work surface and dough and repeat. If the dough still feels tacky, repeat once more, this time covering both the table and the dough with no more than 2 tablespoons flour. 7. Roll the dough into a compact log. Dust the outside with flour, then allow the dough to rest for about 5 minutes. Dust the work surface lightly with flour. Divide the log into 8 pieces. Roll each section into a cylinder about 1/2 inch thick. 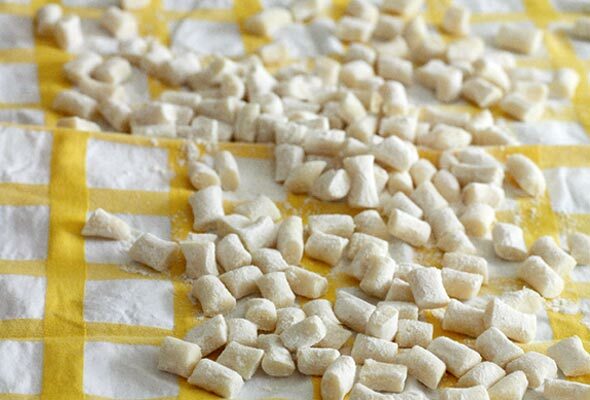 Using a floured knife or pastry cutter, cut the dough into gnocchi about 1-inch long. 8. Bring a pot of heavily salted water to a boil. Working in two or three batches, drop the gnocchi into the water and cook, stirring occasionally, until they float, 2 to 3 minutes. Retrieve the gnocchi with a slotted spoon and put them on a baking sheet or plate. 9. While the gnocchi cook, melt the butter in a large skillet over medium heat. Add the sage and season with salt and black pepper. Allow the butter to brown slightly, about 4 minutes. Add the gnocchi to the browned butter and remove the pan from the heat. 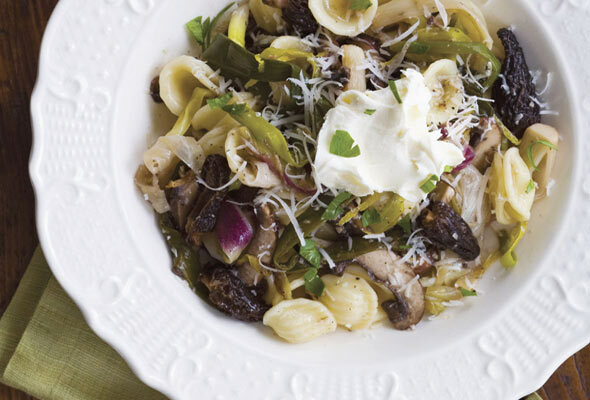 Mix gently and serve topped with Parmigiano. Gnocchi Recipe © 2009 Marco Canora. Photo © 2009 John Kernick. All rights reserved. All recipes and photos used with permission of the publisher. As you stated ingredients vary. I am gnocchi “challenged.” I would like to know what the potatoes weigh—I know there will be H2O variables, etc., but initial potato poundage would set me in the right direction. Hi, an average large idaho potato weigh about 8 ounces. That’s a good starting point. Leah, freeze the uncooked gnocchi right after shaping by scattering them on a rimmed cookie sheet and sliding it in the freezer for several hours. Once frozen, scoop them into a freezer bag and store for up to 1 month. When you’re ready to cook, bring a pot of salted water to a vigorous boil and drop in the frozen gnocchi. Cover the pots and allow the water to return to a boil. Cook and drain as described above. Huge ‘care’ point when cooking frozen gnocchi. They lower the temperature of the water dramatically. Cook a few at a time to avoid this. Conversely use a really large pan with plenty of boiling salted water.